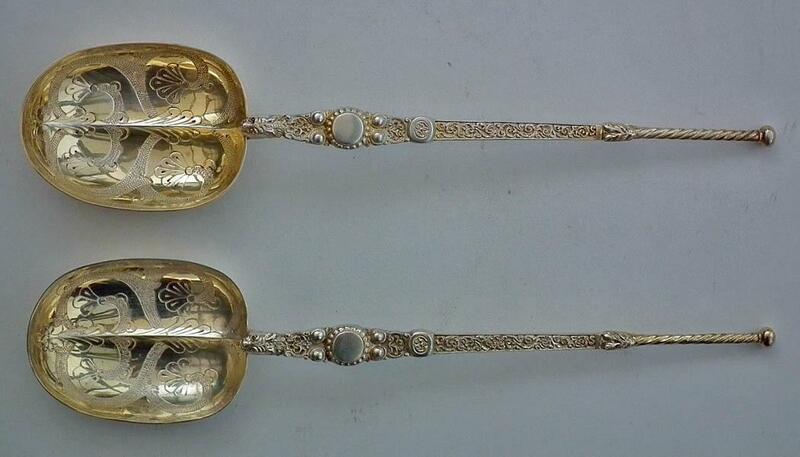 A Pair of superb quality antique, 1900 A.D. English Sterling Silver Gilt Anointing Spoons. 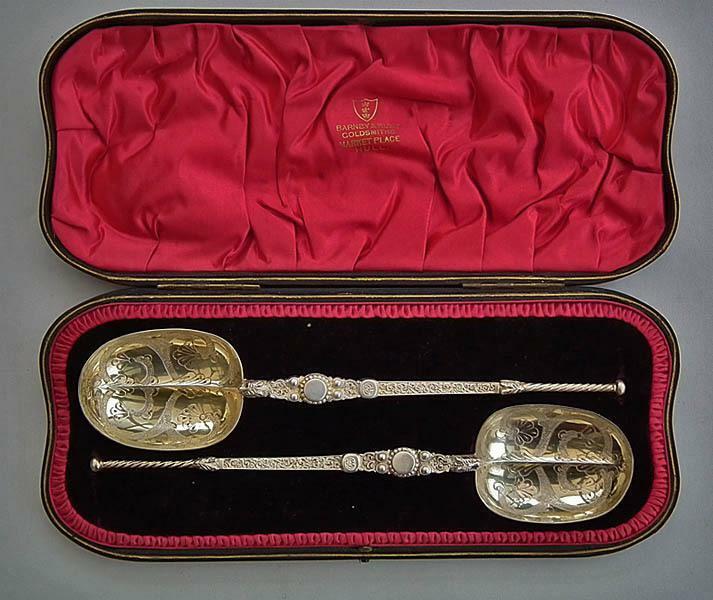 These are replicas of the spoons from the Edward VII and his wife Alexandra Coronation Regalia, as The King and The Queen of the United Kingdom and the British Empire, on August 9, 1902. From what I've read, holy oil is poured from the Ampulla, which is in the form of a gold eagle, into the spoon. The spoon is then applied by the Archbishop to the new sovereigns head, breast and palms. 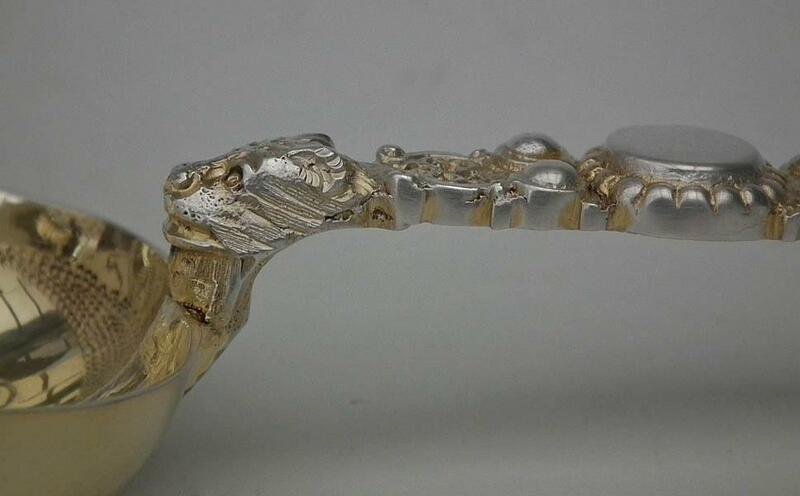 Each of the spoons is made of two separate pieces soldered together, the soldering of one of the spoons is underneath the head of the monster and the back edge of the spoon bowl. 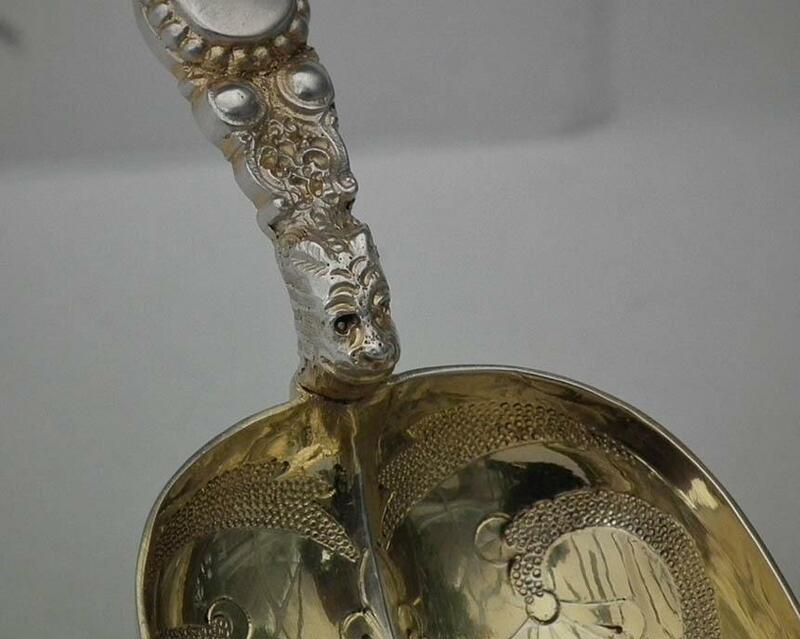 The two parts of the second spoon are soldered together above the monster head, below the flowery rosette (please see the pictures).The entire surface of the spoons is hand chiseled and engraved. 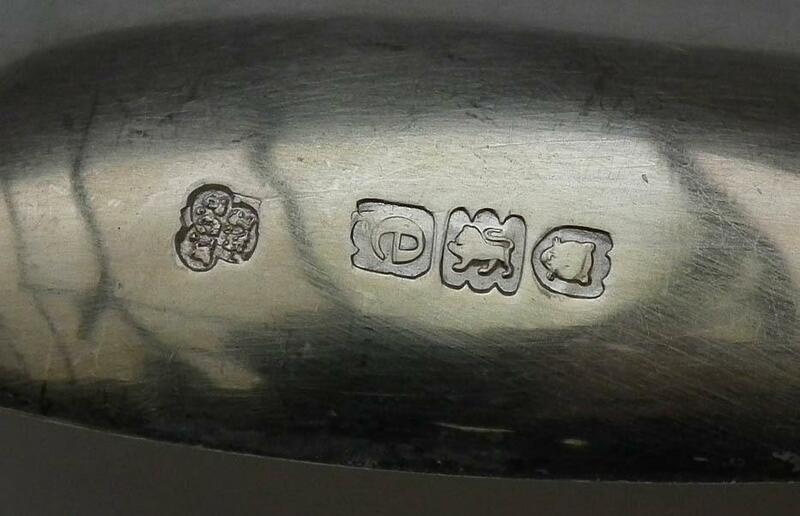 Both of the spoons are hallmarked with the maker's mark "JW/FCW" for James Wakely & Frank Clarke Wheeler, (London), the lion Passant Sterling Silver mark, the Leopard's Head London town mark and date letter "e" for 1900. Most of these coronation spoons were made in the year of coronation 1901, and after the coronation in 1902. 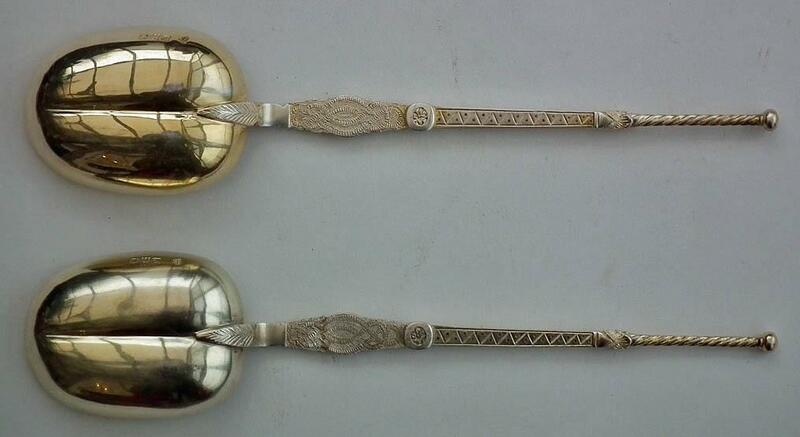 These particular spoons were made in 1900 which makes them very rare examples of the Edward VII Anointing Spoon, since they were made two years prior to coronation, during the life of Queen Victoria. (Died: January 22, 1901 A.D. All of the Edward VII Anointing Spoons made by the "JW/FCW” James Wakely & Frank Clarke Wheeler are stamped with the London date letter "f" for 1901. So perhaps these spoons were made by the "JW/FCW” as the prototype for the spoons made in 1901 A.D.
MEASUREMENTS: Overall length of the spoons: 26 cm (11 1/4 inches). WEIGHT: 192 grams. 6.77 ounces. Dimension of the case: 31 cm x 13.7 cm (12.21 inches x 5.39 inches). 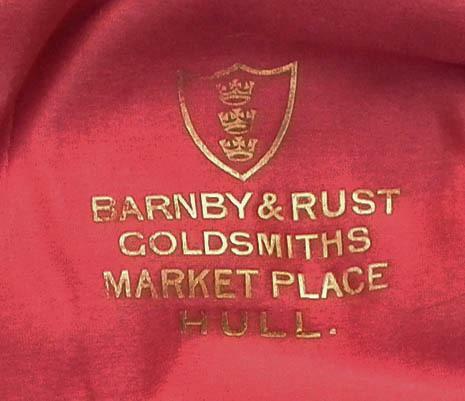 CONDITION: In excellent condition considering its age.